Happy New Year! The NFL regular season came to an end last weekend, simultaneously bringing the curtains down on another fantasy football campaign. 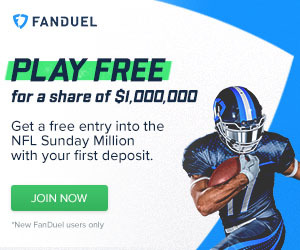 The playoffs are now upon us, and for those fantasy junkies who just can't get enough, the daily formats at FanDuel and DraftKings offer another chance to whet those palates with wild card weekend set to kick off this afternoon. The Steelers have already moved to rule RB Le'Veon Bell (knee) out of tonight's matchup with divisional rivals Baltimore. Bell was injured during the week 17 clash against the Bengals last Sunday night, taking a hit right on his knee from Cincinnati's Reggie Nelson. Bell was unable to practice all week, and was ruled out on Friday. His absence means the Steelers will have to turn to rookies Dri Archer and Josh Harris to carry their run game. Both players combined to account for a total of just 56 yards on the ground in the regular season. Coach Mike Tomlin has stated that Harris will get the start, but Archer will be involved as well. Pittsburgh released veteran LeGarrette Blount in November. Blount's presence had helped limit Archer and Harris' involvement in the game plan. If the Steelers can not establish the run against the always stout Ravens, who will welcome back Haloti Ngata from a four-game suspension tonight, look for offensive coordinator Todd Haley to let Ben Roethlisberger, Antonio Brown and the no-huddle offense take center stage. Le'Veon Bell (knee) has been ruled out for tonight's game against the Ravens. The Cardinals are back in the playoffs, but will take on Carolina in Charlotte this afternoon with Ryan Lindley under center. The game comes just a little too soon for Drew Stanton (knee), while Carson Palmer (knee) is out for the season. Rookie Logan Thomas will back up Lindley, who will simply look to manage the game and control the ball for the Cardinals' injury-riddled offense. If Arizona can escape Carolina with a win, it will be on the strength of their defense and special teams. That said, never count out a Bruce Arians coached team from finding a way to get things done offensively. When the Bengals take on the Colts in Indianapolis on Sunday afternoon, they will almost certainly be forced to do so without the services of stud wideout A.J. Green (concussion). Green has endured a difficult, injury-riddled campaign of his own, and had to leave last Sunday's week 17 game against the Steelers after absorbing a big hit from Pittsburgh safety Mike Mitchell. Green has been entrenched in the league's concussion protocol all week, and was listed as "Doubtful" entering the weekend after missing another practice on Friday. Theoretically, Green has an outside chance of playing, but the doubtful tag is almost always a precursor to being ruled out for good. If Green can not go, Mohamed Sanu will be in line for a heavy dose of targets from Andy Dalton. Smart money would be on Cincinnati employing a ball-control style, limiting Dalton's responsibilities and putting the game in the hands of impressive rookie RB Jeremy Hill and his backfield mate Giovani Bernard. With A.J. Green (concussion) likely to miss out, the Bengals should turn to rookie Jeremy Hill against Indianapolis. Reggie Wayne (groin) has been limited in practice throughout the week, but should be able to go against the Bengals on Sunday. The veteran was hurt during the Colts' regular season finale last weekend, calling into question why the 36-year-old was not rested in advance of the playoffs. Wayne, who missed most of last season with a torn ACL, has been hampered by a triceps injury this term. While he should be good to go, Wayne is no more than a glorified safety valve for Andrew Luck at this stage. Nevertheless, his experience is invaluable, and with the Colts' offense sputtering at times down the stretch, Wayne's presence on the field will be a welcome sight for Indy. Meanwhile, Trent Richardson (illness) is listed as "Questionable," though rookie Dan Herron figures to see most of the work in the Colts' backfield. Richardson has endured yet another disappointing campaign in Indianapolis, and has effectively been phased out of the offense over the last few weeks. Panthers' RB DeAngelo Williams (hand) is "ready to roll" according to coach Ron Rivera, but the veteran is likely to take a back seat to Jonathan Stewart, who has performed very well in Carolina's run to their second straight NFC South crown. With Cam Newton still nursing a variety of ailments, Stewart should see plenty of work against Arizona's defense. Williams will surely be sprinkled in to keep Stewart, who has had injury troubles of his own this year, as fresh as possible. Good luck to all of those taking part in this weekend's daily fantasy football playoff action. As always, be sure to check back with Fantasy Knuckleheads for all of the latest info and updates in the build up to this weekend's action.